Liver cancer is a tumor that starts in the liver, affecting more often men than women. According to the American Cancer Society, over 40,000 Americans are diagnosed with liver cancer, and approximately 30,000 men and women will die every year in the United States, with a continuous 3 percent increase in the annual mortality rate. Hepatocellular carcinoma (HCC) begins in hepatocellular cells and is considered the most common form of liver cancer in adults, accounting for more than 70% of all liver malignancies. Hepatoma is the emergence of malignant tumors in patients with chronic liver diseases and is the third leading cause of cancer deaths, globally. The Hep-3B2.1-7 cell line was established from the liver tissue of an 8-year-old male patient with hepatocellular carcinoma. These cells contain Hepatitis B. The Hep-3B cell line has the Hep B virus integrated into its genome. Also, Hep-3B cells exhibit epithelial morphology and are useful because they make an excellent transfection host (liver biological in vitro model). Hep-3B cells are extensively used for liver disease research as well as for cancer and hepatitis B biomedical research. 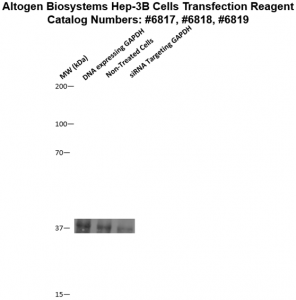 Altogen Biosystems manufactures nanoparticle-based transfection reagent kits for the Hep-3B hepatoma cell line that that yield high transfection efficiency. Figure 1. GAPD mRNA levels were quantified using real-time RT-PCR in the Hep3B cells transfected with siRNAs targeting GAPD or non-silencing siRNA. Forty-eight hours post-transfection, the cells were harvested and analyzed by real-time RT-PCR for GAPD mRNA expression levels. Data were normalized against the 18S rRNA signal. Control samples were either mock-transfected or untreated. Values are normalized to untreated sample. Data are means ± SD (n=5). Figure 2. Protein expression of GAPDH in Hep-3B cells. DNA plasmid expressing GAPDH or siRNA targeting GAPDH were transfected into Hep-3B cells following Altogen Biosystems transfection protocol. At 72 hours post-transfection the cells were analyzed by Western Blot for protein expression levels (normalized by total protein, 10 µg of total protein loaded per each well). Untreated cells used as a negative control.